Every parent wants what's best for their baby, but lots of us don't have time to do tons of research. With so many great options available today, getting started with cloth diapers shouldn't have to be complicated! Launched in October 2011, Thinking About Cloth Diapers is a cloth diaper information website that has been designed with cloth diaper newbies in mind. In the process of laying the foundation for Thinking About Cloth Diapers, Celeste, the founder and author, discovered a number of brands, retailers, and organizations that used their work to help make the world a better place. Impressed with the dedication of these businesses and charities, Celeste started to plan an event that would help build awareness for their worthwhile causes! Welcome to the Choose Your Charity Event, which runs from October 1 to 21, 2012! you can vote for, click here! One lucky grand prize winner will receive $200 in cloth diapers and accessories for themself, and a $300 donation to a children's or cloth diaper charity of their choice! The grand prize includes 6 innovative diapers and inserts, plus a wet bag from Funky Fluff and a Cloth Bundle from Bundles and Buzz! There are also many other prizes to be won, and the top voted charity will receive a $50 donation, too! So spread the word and help your favorite charity win! We are very grateful for the the help from a number of wonderful organizations and businesses who have helped this dream take flight, and we would like to introduce you to a long list of sponsors who have helped make this event so exciting for you, our readers! Funky Fluff was started by 2 moms who were on the quest for the perfect diaper – and when they didn’t find it, they decided to design it. Take a close look at the Funky Fluff Fusion 3 in 1 diaper. This innovative diaper brings a new level of flexibility and versatility to the world of cloth diapering: with the interchangeable AI3 system, you can use these diapers as an AIO system (perfect for dads! ), an AI2 (great for moms! ), and a pocket system (easy for daycares!) No matter how you choose to use them, Funky Fluff diapers are convenient and reliable! Funky Fluff offers both natural bamboo blend and stay-dry diapers, plus diaper pail liners, wet bags, and more! Their fabulous wet bags have two zippered compartments and lots of room for diapers! Our lucky grand prize winner will receive 6 diapers and liners, plus a wet bag! Bundles and Buzz, based in beautiful British Columbia, offers a unique and exciting experience for moms! If you like to discover new brands and save money, then Bundles and Buzz is for you! Bundles and Buzz sells Bundles - an exciting surprise package full of both full-sized and sample size products, as well as discount coupons. And you save money too, because each bundle has a retail value roughly twice the amount that you pay! The Cloth Bundle contains at least one diaper, plus accessories and special savings! Our lucky grand prize winner will receive a Cloth Bundle, with a retail value of $70, and an actual producvt value that is much higher! 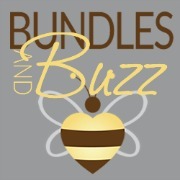 Plus, another lucky winner will receive a $20 gift certificate to Bundles and Buzz! Use it toward a cloth bundle, or try out one of their other bundles! In addition to baby, and toddler bundles, they also offer you the perfect opportunity to treat yourself - the Mama bundle! 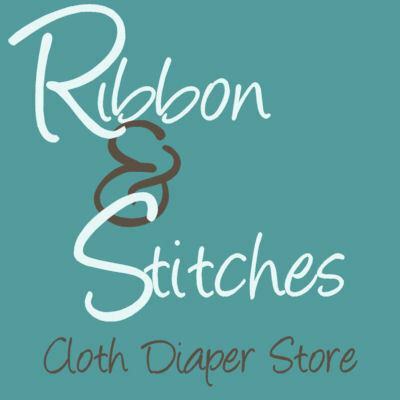 Ribbon n Stitches is both a cloth diaper retailer, and an amazing cloth diaper charity organization. They don't like to say charity, because they say, "We're not a charity, we're a helping hand. We want families to stand a little taller and feel good about what they accomplish themselves. They act as a not-for-profit, where all proceeds from the sale of their cloth diapers go towards helping families who can't otherwise afford the start-up costs of cloth diapers. Every penny they make supports cloth diaper charities Fluffy Wishes and Sweet Cheeks, or is used to provide subsidized baskets for families in their local community of Fort Polk, Louisiana! If you plan to purchase cloth diapers, here's a great organization to support with your purchase! One lucky winner will learn first hand about Ribbon n Stitches' excellent customer service, because they are offering a prize pack, including Rockin Green Detergent and a Fuzzibunz Wet Bag, and a BALM sample! Started by Alanna Butterfield, a stay-at-home mom, Leettle Hands and Feet is another wonderful cloth diaper retailer with a not-for-profit model. When Alanna started her business, she committed to turn over 100% of her sales profits to World Vision International, a charitable organization that strives to make a positive impact in the lives of children and families around the world. Leettle Hands and Feet sells cloth diapers and accessories from their website, www.leettlehandsandfeet.com. They have donated a prize pack including one bamboo diaper, a set of baby legwarmers, and a 32 load bag of Generation Me laundry detergent for one lucky winner. Made in Hawaii, using Earth's most healing herbs and Hawaii's most healing oils, "THE" BALM!, is an all-natural, organic, and cloth diaper safe solution for your baby's diaper rash, eczema, cradle cap, sunburns, bug bites, and more! Malena Taylor, founder of Taylor House Inc., uses only the highest quality ingredients to produce her body and skin line, soaps, and baby care products, plus essential oils! With a focus on their footprint, this company works hard to package all of their products in quality reusable and recyclable packaging (no plastics!) and all of their shipping materials are recycled or biodegradable. One lucky winner will receive a BALM! Baby Diaper Essentials Kit, which includes a 2 oz Diaper Balm, a 9 oz. Juice Those Wipes, a 2.7 oz Sanitize Those Hands!, and a BALM!Baby Little One! Lil Helper is a little cloth diaper company with a big personality! Lil Helper was founded in Toronto by college buddies Nader and Mohammed, with the goal of re-introducing parents to modern cloth diapers. They "believe that all babies, irrespective of their situation, deserve the same level of care as we would for our own children", and so they built a business model and a brand that contributes a portion of their earnings to a deserving cause. For every 3 diapers they sell, they donate a brand new PUL cloth diaper to a family in need through their Baby Do Good program. Stop by their website, to discover their infectious enthusiasm, and to check out their diapers and wet bags! You will have the chance to win two Lil Helper diapers and wipes! Smush Tush is the creation of Kat. Kat lives in Portland, Oregon. She is the mother of two little Smushes under the age of three and a part time pediatric RN. Kat started Smush Tush in Spring 2012 because she believes in cloth diapers. She says, "Nothing makes more sense than saving money and keeping landfills free from everlasting disposable diaper garbage, and, of course, there is nothing cuter than a fluffy tush!" Kat donates $1 from every Smush Tush sale directly into a Morale Fund for the unit she work on at the Doernbecher Children’s Hospital in Portland. She works in an Intermediate Care Unit, which is a step-down unit from the Pediatric ICU. Most of her patients suffer from congenital conditions, brain tumors, extreme developmental delays, and trauma incidents. These extremely sick kiddos do not see much in funds from the community like other units do, and she felt an immense need to help. You can check out her custom diapers in her Etsy shop, and be sure to like her Facebook page to keep up with all of her custom releases! Smush Tush is donating a custom pocket diaper of the winner's choice. The winner will be able to pick outer and inner fabrics and will work directly with Kat, the owner of Smush Tush, to pick out a totally custom creation! Founded in Pennsylvania by Jona Heise, The Little Bee Company developed the slogan "Bee Changed and Change the World". And that's exactly what they are doing, one diaper at a time. For every diaper purchased, another one is donated to an orphan in need. Through their diaper drops, The Little Bee Company is attempting to improve sanitary conditions in orphanages around the world, and also make people aware of the orphan crisis that exists! You can read more about Little Bee Company's mission here. The Little Bee Company sells newborn, one-size, and swim diapers, and has diaper colors that represent the home countries of children in need - Japanese, Russian, Guatemala, Mexico, Honduras, Africa, China, Cambodia, and of course, at home in the US. One lucky winner will receive a Little Bee Company one-size diaper in Russian Sunflower, a bright, happy yellow! Glow Bug Diapers' founders, Sarah and Neta, started their own diaper company after becoming frustrated with the high costs of the cloth diapers that were already on the market. They understand that many parents find cloth diapers intimidating because of the cost to get started, and so they launched a cute line-up of quality, affordable diapers. This Canadian-based company sells diapers in packs of 12, rather than individually, and offers girl, boy, and gender neutral print sets. Glow Bug Diapers will be offering one of their diapers to one lucky winner! Winner's choice of gender neutral, boy, or girl! Eco Parent is a Canadian print magazine catering to eco-aspiring and eco-savvy parents. Published quarterly, it is their mission to give you the knowledge and inspiration you need to make better, healthier choices for your family! Eco Parent offers both a digital and a print version (printed on a matte environmentally-friendly paper), and it has excellent articles, photography, and content! One lucky winner will get to try out Eco Parent with a free subscription (print if you reside in Canada, or digital if you are from the US). Eco Parent has also offered a special subscription discount to all Thinking About Cloth Diapers readers. For a limited time, you can save 20% off the cost of an annual subscription to Eco Parent with the code: thinkingaboutcloth. Nature Bumz is a Canadian cloth diaper retailer based in Niagara Falls, Ontario. In December 2011, they undertook a huge initiative - putting together cloth diaper starter kits for the Salvation Army and Hannah House Maternity Shelter, in a project they called Operation Bumz Child. With the support of their customers and suppliers, they were able to donate more than 250 cloth diapers, plus accessories, to these worthwhile causes! One lucky winner will receive 2 Fuzzi Bunz Diaper Talk diapers thanks to Nature Bumz! We would also like to thank all of the retailers who have purchased advertising space on our Charity Profile pages, helping us to raise the money for the grand prize cash donation! 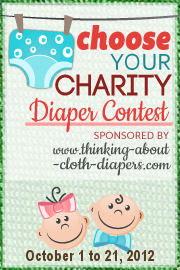 the cloth diaper charities you can vote for! For your chance to win, and to place your vote for your charity of choice, please fill out the Rafflecopter form below! Please click here to forward this page to a friend!